Eating, while traveling, is all about learning. Learning about a place, yes. But also about your own appetites. I live for that revelation of biting into something new, discovering I love it, and wondering where it has been all my life. The world seems wider, more hopeful in those moments. Normally I find two or three dishes that stay with me and that I hope to return for one day. In Italy, I found new obsessions almost everywhere, even during quick pit stops for snacks or gelato breaks. I can think of at least ten things I need to come back for. It helps to know that Italians, too, are obsessed with their own food. They are what we would call "food snobs" here in the US. The label cancels itself out because they are all snobs, ready to give you their opinion on how to choose your pecorino and which market vendor sells the best salumi. In Tuscany, we asked our cab driver where we might pick up steaks to grill back at the house we stayed in. He insisted on parking the cab outside the butcher's and taking us inside himself, so he could translate and help us pick the right ones. We didn't, he insisted, want to put our dinner in jeopardy because of a language barrier. But I think he'd be surprised how far a desire to eat well often takes us. Antica Caciara—This salumi and cheese shop has been a staple in the Trastevere neighborhood since 1900. Over a century in business, apparently, leads to perfection. I'd never tasted pecorino that bright, sharp, salty, and wonderfully flakey all at once, the technicolor version of the mild, not-as-good-as-parmesan pecorino I'd known before that. Casa Mia—In the name of sampling the menu and of vacation in general, I shamelessly ordered two plates of pasta here. Carbonara and cacio e pepe. Both entirely worth the cringe-y moment when I explained to the waiter, in broken Italian, that yes—they were both for me. Da Enzo—A tiny, tiny trattoria in with a giant line, worth the extra moment to call and make a reservation the day before. I ordered amatriciana, a Roman pasta dish that is greater than the sum of its parts which are olive oil, cured pork cheek, tomatoes, and pasta water as far as I can tell. When they come together, the sweetness of the tomatoes and the salty, sumptuous feeling of that pork cheek multiply tenfold. It's really something. Emma—Make a reservation here, if you want to come for dinner. For lunch, we were able to drop in spontaneously. Twice. (Okay, the second time was very much premeditated.) It pretty much derailed our afternoon both times. In a nice way. In a food-drunk (and actual drunk) kind of way from a big plate of salumi, a bottle of Prosecco, and heaping portions of cacio e pepe. Fatamorgana—Thank goodness this gelato shop has more than one location. I came back three times (in different neighborhoods) for their orange-almond flavor, which felt dense and velvety and tasted like exactly what you think orange zest will taste like if you don't know any better, like an orange distilled—sweet, intensely bright and floral with a pleasant acidity. Innocenti Suppli—The dumpling of Rome and the perfect snack (or appetizer, or meal, depending on your ambitions). It's a rice ball mixed with tomato and veal, stuffed with mozzarella, breaded, and fried. It's the kind of crispy, pillowy, starch-on-starch-with-melted-cheese combination that melts my heart right out. You can get them all over Rome, but this place made my favorite. L'Arcangelo—A cozy place with some innovative things on its menu. Although I honestly don't remember anything other than the artichokes, which tasted like they'd been soaking in olive oil for weeks. Tops removed, they glistened on the plate and fell apart at the gentle prod of our forks. If you've ever wanted to mainline an artichoke—if you love them that much (like I do)—this intense, pure flavor is as close as you'll probably get. Mercato Centrale Roma—A similar concept to Grand Central Market here in Los Angeles and Chelsea Market in Manhattan, this is a collection of vendors inside of Termini Station, Rome's central train hub. Adam and I ate lunch here on our last day in Rome and found it a great way to reminisce about all the good food we had. We found artichokes, panini, suppli—everything we wanted one more taste of. La Norcineria di Lacozzilli—Porchetta. Porch. Et. Ta. The name rolls off your tongue like the fatty, amplified-umami flavor of porchetta on fresh ciabatta. Even one little sliver holds enough concentrated flavor to make you weak in the knees. It's almost not fair, how it makes everything else around it taste pale and bland by comparison. Pane e Salame—You can order a giant cheese & salumi board here for 12 Euro, so I don't think I have to say anything else except that you should arrive before it opens at 11am. It's located in a touristy area (near the Trevi Fountain) and the line builds up quickly. But 12 Euro for copious amounts of pecorino and prosciutto and speck. It's worth the hustle. Pasticceria Trastevere—Italy is one place you won't be judged for having an all-sugar breakfast. It's tradition here. Sugar in the espresso with more sugar on the side, usually in the form of a cornetto or brioche (which is not like what we put our hamburgers on, I learned, but more like a croissant filled with chocolate or jelly). This place has good ones and lots of cute Italian cookies which I can't remember the name of now, but which I ate a lot of. San Cosimato Market—One of Rome's farmer's markets located in Piazza di San Cosimato in the Trasevere neighborhood. 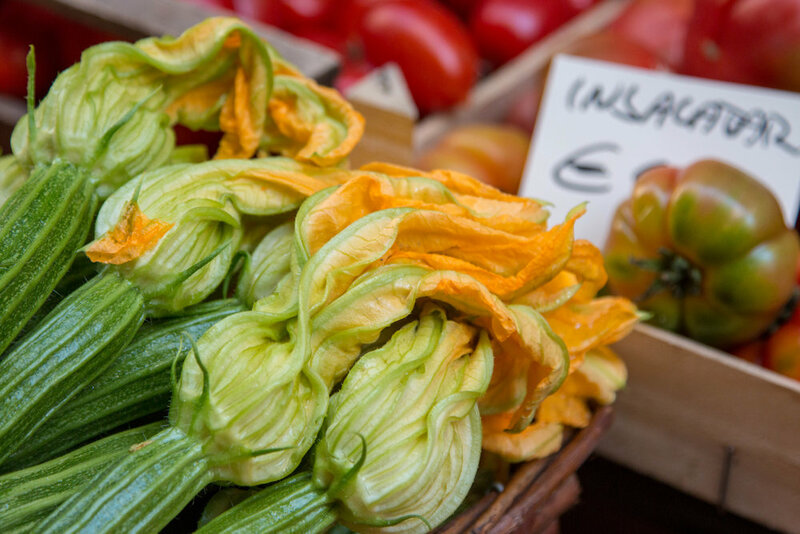 Smallish, but packed full of attractive produce and certain things you can't find in the US, like another obsession I left with: zucchini flowers. You can also get fresh cantaloupe wrapped in speck and loaded up on a skewer from one of the vendors there. The best shish kabob you've ever had.